training is available to ensure that professionals who work with children and families have up-to-date information. Babies Can't Wait is administered through 18 District offices throughout the state. Through the 18 offices, children and families in every county in Georgia can access early intervention services. Anyone can refer a child to Babies Can't Wait. In order to refer a child to BCW for an evaluation, contact the district office which serves the county in which the child and family reside. You may use the Children and Youth with Special Needs Coordinator Contact List for information on how to reach local Babies Can't Wait Programs. BCW has a statewide directory of information managed by Parent-to-Parent, Inc. of Georgia. The directory provides information about the BCW Program located nearest to the child and family. To access the directory, call 1-800-229-2038 or (770) 451-5484 in Atlanta. The State BCW Office number is (404) 657-2726 or toll free: 1-888-651-8224. You may also use the Children and Youth with Special Needs Coordinator Contact List for information on how to reach local Babies Can't Wait Programs. Easter Seals North Georgia provides high quality services to ensure that all children with disabilities or other special needs and their families have equal opportunities to live, learn, work and play in their communities. Easter Seals Southern Georgia creates solutions that change the lives of children, adults and families with disabilities or special needs by offering a variety of programs and services that enable individuals to lead lives of equality, dignity and independence. Easter Seals Middle Georgia's mission is to provide vocational rehabilitation and other services to people with disabilities and other barriers to enable them to live lives of independence and dignity through meaningful work. Established in 1982 under the Tax Equity and Fiscal Responsibility Act (P.L. 97-248), the Katie Beckett Medicaid Program (KB), permits the state to ignore family income for certain disabled children. It provides benefits to certain children 18 years of age or less who qualify as disabled individuals under §1614 of the Social Security Act and who live at home, rather than in an institution. These children must meet specific criteria to be covered. Qualification is not based on medical diagnosis; it is based on the institutional level of care the child requires. Title 42 Code of Federal Regulations outlines the criteria used to determine eligibility. The Down Syndrome Association of Atlanta provides financial support and partners with the Emory Down Syndrome Clinic, which is part of the Department of Human Genetics, School of Medicine, at Emory University. The Emory Down Syndrome Clinic serves children with Down syndrome from birth to age seven. Staff from the Emory Down Syndrome Clinic present at DSAA conferences and are an integral part of the New Parent Seminar that DSAA offers twice a year. Each family's visit to the Emory Down Syndrome Clinis is an individual appointment. The clinic team includes physicians and staff (geneticists, educators, social workers, and others) who have extensive experience in genetics and development with an emphasis on the needs of individuals with Down syndrome and their families. The clinic is a specialized resource and complements the care provided by your child's pediatrician. The Lowcountry Down Syndrome Society is a family support group to benefit people with Down syndrome and their families through local leadership in support, outreach, education and advocacy. Mission:To promote awareness and acceptance for all individuals with down syndrome living in the South Georgia area. 1. DSA of South GA plans to provide support and resources for Down syndrome in our area. This support would be offered to new parents, family members or individuals living with Down syndrome. We also plan to offer educational resources through such things as a material library and informative guest speakers. 2. DSA of South GA is bringing a Buddy Walk to the Valdosta area. The Buddy Walk was established by the National Down Syndrome Society to bring attention to Down Syndrome Awareness month in October. The Buddy Walk is a one-mile walk in which anyone can participate without special training. It is a wonderful, heart-warming event that celebrates the many abilities and accomplishments of people with Down syndrome. 3. 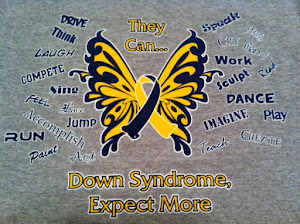 DSA of South GA hopes to bring attention to the community in regards to the facts around Down syndrome. The best way to increase tolerance and awareness is through community events and media participation. The vision of the NDSC is a world with equal rights and opportunities for people with Down syndrome. It is the purpose of the National Down Syndrome Congress to create a national climate in which all people will recognize and embrace the value and dignity of people with Down syndrome. Promote the availability of and accessibility to a full range of opportunities and/or resources that meet individual and family needs. Build a sense of community and fellowship for all people concerned with Down syndrome. Provide leadership in the formation of public policy. Encourage ethically responsible research related to all aspects of Down syndrome. Educate professionals, parents, and community in all aspects relating to Down syndrome. Foster self-advocacy and acknowledge the importance of self-actualization for persons with Down syndrome. Recognize and advance the full range of rights of all people with Down syndrome. Promote full participation of people with Down syndrome in all aspects of community life. Recognize the variability of personal needs and respect individual choices. Develop and disseminate position statements on major issues related to Down syndrome. Provide a network for linking of state and local groups and affiliates. Foster and enhance relationships with the NDSC community and the broader disability community. The Chattahoochee Valley Down Syndrome Support Group serves to enhance the lives of all individuals with Down syndrome by providing information and support to the individuals, their families and the professionals working with them.